The BQE as seen from the Brooklyn Bridge Park. Photo via flickr user xbettyx. A few weeks ago, I took a walk through Brownstone Brooklyn from Park Slope to the East River. I wanted to check out the new happenings at the Brooklyn Bridge Park, and after a stroll through the playground at Pier 6, I started to head toward Pier 1. Now, this week, a walking and biking path along the waterfront opened, but in early August before this path was ready, the best way to go from Pier 6 to Pier 1 was along Furman St., a little-used road underneath the double-decked BQE. Instead of tracking the cantilevered road way that serves as a barrier between Brooklyn and its picturesque waterfront, we opted for a leisurely stroll through Brooklyn Heights and along the Promenade instead. Since Robert Moses first started tracing the contours of the Brooklyn-Queens Expressway and the connecting Gowanus Expressway, it was a controversial road. Built mostly above-ground, this elevated magnet for traffic jams tore through neighborhoods, and Moses famously refused to move the planned route one block west so it wouldn’t destroy a vibrant mixed-use community along 3rd Ave. in Brooklyn’s Sunset Park. Built without space for transit options, the BQE has cast a shadow on New York’s two most populous boroughs for decades. Today, the BQE is a mess. It’s part of an important arterial road through that connects New Jersey, Staten Island, Brooklyn, Queens and the Bronx; provides access to key East River bridges; is well over capacity; and is living on borrowed time. While the road isn’t in danger of an imminent collapse, the physical structure is degrading quickly. Since the late 1990s, the city has toyed with the idea of righting the wrongs of the Moses Era and burying the parts of the BQE that shouldn’t be above ground. A map of the proposed tunnel to replace the BQE. Click to enlarge. State transportation officials are considering a tunnel under Brownstone Brooklyn that would stretch all the way from the Prospect Expressway to the Brooklyn Navy Yard, thereby bypassing all of Downtown and clearing the way for a major repair of the crumbling, sclerotic triple-cantilevered portion of the Brooklyn-Queens Expressway in Brooklyn Heights. According to [Roy] Sloane [a Cobble Hill resident who proposed the idea], the tunnel could serve as an express route to North Brooklyn, while the triple-cantilevered stretch of the BQE would become a “local” route that would funnel traffic to the Brooklyn and Manhattan bridges as well as local streets. Still, there were some differences among proponents of the tunnel as to what should be done with the decaying stretch of the BQE. “I don’t like that because it creates more capacity, and once you increase capacity drivers start using it and you create more problems,” said Swerdlowe, adding that he preferred a tunnel with exits to local streets and that the triple-cantilevered roadway could be converted into a recreation area of some sort. In an ideal world, Swerdlowe’s dream would become a reality. A tunnel to replace the BQE would allow for adequate connections to local roads and the Brooklyn and Manhattan Bridges while the cantilevered roadway would be opened up to allow more direct access to the Brooklyn Bridge Park and waterfront. Furthermore, one goal of the road repair and replacement project should not be to encourage more driving in and around downtown Brooklyn. For now, this tunnel remains a great idea on paper, but it’s a long way from reality. The Downtown Brooklyn BQE project is already 13 years in the making, and the New York State Department of Transportation doesn’t anticipate construction to start until 2017. By 2020, this road replacement, now budgeted for $254 million, will be complete. A tunnel through Brooklyn would cost significantly more than that and, if Boston’s Big Dig is any indication, take far longer than three years to complete. Still, the city needs to dream big, and by doing so, it can restore access to a part of the Brooklyn waterfront people, and not cars, should be enjoying. An excellent idea, but judging from the map, this tunnel will intersect with Brooklyn’s subway hub at 4th & Atlantic. How deep would this have to be to bypass all those train tunnels? Also, will this have more lanes or the same amount? I can see bottlenecks happening at the merges of the tunnel with the elevated, but overall, still a great idea. I’d like to point out that digging a kilometer of roadway tunnel costs more than digging a kilometer of subway tunnel – nearly twice as much, if we compare the Big Dig to Second Avenue Subway. This means that the opportunity cost of this is two more phases of SAS, plus the extra station at 41st and 10th on the 7 extension. It’s already feeling like the City’s very own $22bn, two decade equivalent of the Commonwealth’s Big Dig. Fortunately, unlike the Big Dig, this project does not endeavour to replace an existing highway in place and can go underneath most of the obstacles that plagued the Big Dig, such as the active northeast rail corridor into Boston’s South Station. Also, the project may benefit from being able to go through bedrock instead of through landfill, which comprises a good amount of modern Boston’s existing land mass, much like the City. Though I’m not a geology expert, so it’s quite possible that bedrock is much deeper in Brooklyn, especially since Long Island is just a terminal moraine. That said, it’s reasonable to say that the estimate should be much lower than the Big Dig, which was much more than an arterial replacement – it essentially detangled downtown Boston’s major arteries and thus its scope was massive. As far as traffic goes, the Big Dig only added one more lane in each direction and helped develop more efficient traffic patterns, which effectively added capacity, but all of this additional capacity has only served to induce more driving, more traffic, and much more dispersed traffic to the feeder roads and highways (The Globe via Wikipedia). With that, it’s possible that this BQE rerouting may solve traffic issues along the new corridor, but will induce more severe traffic elsewhere. Let’s hope that estimate stays lower than $500mil, though that will only go up over time and there’s no better time than to strike when the iron’s hot. And the race is on! Who can build a tunnel faster, MTA or NYCDOT? But to Alon’s point above, roadway tunnels are indeed different. They need more ventilation because the vehicle traveling within are all gasoline- or diesel-powered. They need to be much wider to handle multiple lanes of traffic, with a safety cushion on either side. Plus, if you look at the planned Oyster Bay-Rye tunnel, you’ll see the model may now be to have a third “service tube” to handle emergencies in the other two (whether it is for emergency vehicles, pedestrians, or just utilities, I don’t know). Often, Hazmats are prohibited in tunnels for safety reasons, and Lord knows what’s in the trucks travelling on the BQE. Then what? This happened with a short tunnel built in Trenton, NJ. It was promoted as a way of getting trucks away from residences and parkland, but then the trucks were prohibited from using the new tunnel and had to use Rt. 129, a 6-lane arterial road with traffic lights. A good idea, but it may need some more study. Modern rail tunnels of significant length usually also have a third service tube to enable emergency and utility vehicles to access the tunnel (e.g. the Channel Tunnel). Speaking of the Chunnel, I always find it funny how these auto-centric tunnels always talk up pollution reduction and traffic mitigation, but it’s not always the case. The case they make for the OBR Cross-Sound tunnel as taking the load off of the I-95 corridor through the City is a load of bull; the Outerbridge crossing, Verrazano bridge, Belt Parkway/Southern State, and LIE already have capacity issues resulting from local traffic, let alone people using the corridor as an alternative to I-95 via the I-495 extension through Manhattan. Why so few of these proposals have come anywhere near using a successful passenger/auto/freight via rail system used in the Chunnel is beyond me. It would solve so many issues with environmental remediation and protection, cost (through reduced tunnel size), (increased) throughput, revenue, and safety (if you’ve got to design the interior of the tunnel to be interesting so drivers don’t fall asleep in it, you’ve got a problem). As far as hazmat is concerned, the tunnel just needs to undergo a rigorous and lengthy federal hazmat certification process in order to do so. Surprisingly hazmat cargo is permitted through the chunnel. I assume hazmat certification would entail proper emergency provisions in the event of an accident and means of containing/cleaning the cargo. Marc, the alternative to a road tunnel is not an undersea tunnel. I’m comparing the cost of the BQE Dig to the cost of normal two-track subway tunnels. Sorry, didn’t mean to confuse you with that tangent about the cross-sound proposals, though cross-sound crossings fall into the same class (in terms of length, regional connectivity, and purpose) as the Channel Tunnel. No, I think we’re pretty much in agreement. If this is only a bypass, with minimal connections to the local street grid, it would be very useful and not as expensive as you might think. Subway tunnels are cheaper to build, but half the cost of building subways is stations, not the tunnel itself. The Big Dig was way more complicated that just building a tunnel and involved the relocation of numerous train lines, the construction of many underground or semi-underground highway interchanges, a new tunnel to the airport, a new bridge over the Charles River, and a new BRT busway. If the existing BQE were also turned into a boulevard with dedicated bus or light rail lanes serving the Navy Yard/Ft Greene on one side and Red Hook on the other, this could easily be worth it. One of my main questions/problems is that traffic on the BQE between the Williamsburg Bridge and the Brooklyn Bridge is not that heavy. Is there really a demand for a quick way to get from South Brooklyn to North Brooklyn? Seems like most people are going to/from Manhattan or downtown Brooklyn. Indeed, never thought about that last part. Could it be another Sheridan Expressway? The subway costs I’m considering include the stations. For SAS, if you exclude stations the cost goes down by a factor of 4, making it not one half as expensive as the Big Dig but one eighth. Most of the traffic on that stretch isn’t local traffic, it’s people traveling from, say, Queens to Brooklyn – and the transit options for those kinds of trips stink. And where would they put the probably 3+ ventilation buildings that would be required? Which communities along the route would agree to have a vent plans spewing car exhaust located there? Chichen, Moses didn’t care for tunnels. Jay, this map is just a concept for discussion purposes – I know at my table we talked about options for routing a tunnel around the Vanderbilt Yards/Atlantic-Pacific subway complex . . . but tunneling is definitely technically feasible. This design is a move in the right direction . . . but as long as we’re thinking big, let’s incorporate the hulking, obsolete blight known as the Gowanus Expressway. Convert 3rd Avenue and Hamilton into amazing boulevards when the tunnel is complete and the elevated structure torn down. Convert the existing BQE into a design with a more human scale. 278 is a major freight corridor . . . THE major freight corridor heading east of the Hudson. This is a project of national importnace and deserving of significant federal funding. On a local level I believe we could afford a significant contribution from tolling and from tax increment financing or a variant that would capture the revenue from increased property values and development along the corridor. For all the scare stories about the Big Dig you hear, it’s the best thing to happen to Boston in the last 50 years. Truly an incredibly beneficial project. If a tunnel is built , third ave under the highway can be converted back in to valuable real estate(no low income housing nonsense) to help pay for the project and connecting the neighborhoods back to the industrial waterfront. The combined current roadway plus the elevated middle section is supper wide and can allow for a combination of developments etc. This should have been done when originally proposed two decades ago instead of the complete renovation of the current structure. I assume that if this project were to occur, the viaduct on Hamilton would be removed and converted into a boulevard. Leaving it there would make no sense. The problem with removing the 3rd Ave. viaduct, however, is that the BQE is such a major truck route. So, the resulting “boulevard” would not be some beautiful stretch of roadway that is friendly to pedestrians and bicyclists. It would be choked with big, ugly, noisy, gasoline-spewing trucks. The only way to make 3rd Ave. into a West St.-style boulevard would be tunneling under it. As this would probably be insanely expensive, it seems that leaving the 3rd. Ave viaduct in place is the only realistic option. Unfortunate, but every aspect of the city cannot be perfect. I like the idea about separating the local and through traffic. If people are worried about increasing capacity, the tunnel could be built with only one lane in each direction and a breakdown lane in the middle or make it reversible. (Another option is that it could also be for trucks only.) I’m suggesting this because it would be slightly cheaper and from what I’ve seen only about half the traffic is through traffic. But I have a big question about the feasibilty of even building such a tunnel. I can already hear the bownstoners already complaining about the excess vibrations that are destroying their precious buildings. If a tunnel were to be built at all, I’d rather it replace the Third Avenue section of the Gowanus so that area could be redeveloped. Someone should calculate the cost of that tunnel considering the tax revenue that would generated if the area were to be redeveloped for higher end uses. What ever happened to that plan? I think it offers more benefits than one in Brooklyn Heights. If not a tunnel, how about moving it above ground to along the shore line instead of above Third Avenue? If not a tunnel, how about moving it above ground to along the shore line instead of above Third Avenue? That would certainly right the wrong of Robert Moses’ planning, and that’s what Sunset Park wanted when the road was going up. Putting it along 2nd Ave. wouldn’t have torn through the neighborhood. I hesitate though to say it should be along the shore because the city’s shores should be for the people, not cars. We’ve managed to ring Manhattan with roads that block access to shore lines; we shouldn’t be encouraging that planning in outer boroughs too if there are better alternatives. I don’t understand why there’d be an emphasis on capacity constraints. If the road is underground, why would anyone care if it moved 25,000 people a day or 250,000 people. Is the objection that no one anywhere should drive even if it’s on an underground route that is completely unobservable to people on the surface? That seems like an extremist position. A tunnel project like this would be of enormous benefit to the people of Brooklyn and to the millions to their east who need to traverse the west end of Long Island. Ideally, you’d ultimately pair it with a cross-harbor tunnel that would take trips completely off Brooklyn, Manhattan and Staten Island routes and get it past the Hudson where it wants to go. 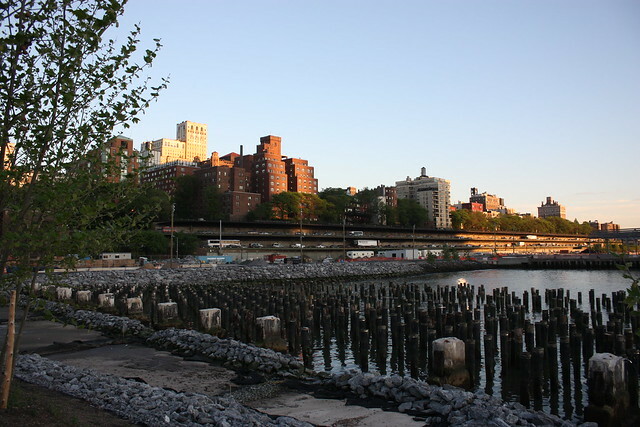 There is a well-used park along the FDR Drive, Riverside Park, and the bike path and walkway along the Narrows by the Belt Parkway, so I don’t see how a highway precludes use of the shorefront. Even if it makes it less accessible than if there is no road at all, I think the benefits for redeveloping Third Avenue outweigh the disadvantages. 3. The Powers that be then designed to add in money for park development and ground treatments on the surface where the Central Artery had been. While tunneling won’t be cheap, you can’t use the Big Dig as a $ for $ equivalent. The Big Dig has been an enormous success for Boston. It’s too bad that costs were high and too bad that there appears to be an endemic culture of corruption that led to waste, but the capacity, connectivity and aesthetic gains from the project are not debateable. Right, the Big Dig wasn’t just a tunnel, although the tunnel was the “signature” part. But then you add in the Zakim bridge, the transit changes, all of the underground interchanges, the above-ground remediation and really what the Central Artery Project should be known for is a wholesale reclamation of the eastern side of the Financial District which happened to involve some tunnels. Perhaps it may have been better marketed as the Central Artery Network and Downtown Recovery Project, though despite all the publicity MassDOT (EOT at the time) could’ve done for what many consider today to be the ancillary components of the project, the most visible component for most Bostonians is the main tunnel, as upsetting as that is. Thinking about it as a network improvement project certainly makes the $22bn price tag a bit more easy to swallow. That said, this BQE replacement could very well turn into one such a network improvement project if it happens to also include reclamation of the current BQE corridor and improvements to feeder roads for improved traffic flow. I could argue it the other way: Boston is a cheaper city overall for construction than New York. The proposed North-South Rail Link is projected to cost $800-1,600 million per km, compared with $1,700 for Second Avenue Subway Phase 1, despite the fact that Second Avenue Subway is technically simpler, not passing under older subway tunnels until Phase 3. This project comparison sits much better with me, since it’s a rail-to-rail comparison, but even then there are still subtle differences in the natures of the projects from each other in terms of purpose, traffic type, geology, etc. We can argue the differences until the cows come home, but ultimately you’re right in saying construction is cheaper in Boston, despite both being harbour cities (assuming build materials would travel in via water). Regional traffic and accessibility play a huge factor: Boston is a peninsula and Brooklyn is on an island accessible only by two other islands or New England, depending on where the build materials are coming from. Then you have local traffic and accessibility. Without knowing anything about the geological structure of the underlying land, I would hope that most of a Brooklyn Tunnel could be built deep enough that TBM’s could be used instead of the much more expensive (per mile) slurry wall excavated construction that was used for the Big Dig. Yeah, I had made allusion to ground composition in my post above, but I had completely forgotten about the cost differential between slurry wall construction and TBM construction, which is actually feasible because of the proximity of bedrock in most parts of the City. Again, not being a geological expert, we can only infer ground composition based on the locales’ geologic history: downtown Boston is mostly man-made landfill and the area in question in Brooklyn (and all of Long Island) is a glacial terminal moraine. You guys should familiarize yourselves with the epic community effort to put the Gowanus in a tunnel — which has been raging since at least 1996. The community won an $18m tunnel feasibility study. I think the SDOT’s current cost estimate is $12.8B for 3.5 miles or $3.65B/mile, and the community coalition’s estimate may range to below $2B/mile. In any event, the reason for not tunneling is money — there is none, and there’s not going to be any, anytime soon. The projected state budget deficit is about $8B and there is no round 2 federal stimulus. A Gowanus tunnel toll wouldn’t come anywhere near raising the cash to support project funding without a big dollop of federal or state help. This new tunnel wouldn’t do anything about the behemoth along 3rd Avenue from Prospect Ave to 65th Street, though it would eliminate the elevated highway above Brooklyn’s Park Avenue. The eliminated section is mostly in an open cut along Hicks Street, not the best thing, but not as bad as that elevated on 3rd Avenue. Remember, when Moses first put the elevated highway on 3rd Avenue in the 1940s he used an already existing elevated train structure to do it. So, beginning in the late 19th or early 20th, Third Avenue had always been shrouded by an el of one sort or another at least part of its route. Time to open up 3rd Avenue to the sunshine for the first time in over a century. Agreed that the 65th St.-Prospect Expressway section would be the place to start, since there are no subway tunnel conflicts there and it would be a 1-for-1 replacement of the elevated line. The section from the Prospect to the Battery Tunnel would be a little more complicated, with the needed tunnel under the Gowanus and the underground interchange with the Prospect Expressway that would have to take the 4th Avenue BMT tunnel into account, but that would probably still be only a fraction of the cost of running the BQE straight under Downtown Brooklyn and beneath the maze of subway tunnels in that area — let alone the fact that some sort of access would still have to be provided for BQE drivers to and from the Brooklyn and Manhattan bridges. But now, instead of the highway running right underneath both bridges allowing for direct or nearby access, the highway would be discharging cars and trucks right into the middle of Downtown Brooklyn, to head north on Flatbush to the Manny B or west on Atlantic to the Borough Hall area to access the Brooklyn bridge (or you could add feeder tunnels to both bridges, which would keep the cars and trucks off the street but would have to wind in and around even more subway tunnels). Best plan, if they ever do build the tunnel, would be to at least follow the current BQE route from 65th to Atlantic, and then if they wanted to shortcut east of Brooklyn Heights and way from the promenade, the road would still be close to the Brooklyn Bridge and Manhattan Bridge ramps to allow access to Manhattan, even though the problems crossing the Joralemon, Montague, Clark, Cranberry and Rutgers tunnels while providing bridge access ramps would remain. A lot of the traffic on this section of the BQE is heading from the south to the Brooklyn and Manhattan Bridges – passing the Battery Tunnel on the way. If the bridges were tolled at the same rate as the tunnel, the incentive to avoid the tunnel would immediately disappear, and traffic volumes here would drop substantially. They might just drop enough to permit the removal of one lane in each direction – which would then allow for shoulders on the existing roadway. not mentioned in the prior posts is the idea of building the “brooklyn heights bypass tunnel” along the lines of paris auto routes using cheaper lower height tunnels. Manhattan bound, local traffic and trucks would have to use the rehabilitated current route but cars and vans would be able to use the new two lane tunnels. This exclusion of trucks could provide substantial savings due to the height savings, lower ventilation needs and perhaps even narrower lanes thus a narrower tunnel. Tunneling should be focused on the “brooklyn heights bypass tunnel” as this section of road is far less functional than the 3rd Ave section of the BQE. Also some tunnel is needed as part of the reconstruction efforts of the existing highway. The same not true of the 3rd Avenue section.